Dr. Mary Walker (1832-1919) was the first woman awarded the Congressional Medal of Honor for her work as a commissioned surgeon during the American Civil War. A strong proponent of women’s rights, she wore male attire throughout most of her life and was once arrested for doing so, as reported in the New York Times’ June 6, 1866, edition. 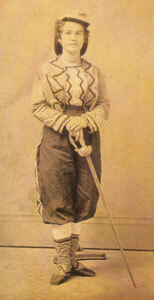 Thilges re-created Dr. Mary Walker’s bloomer or reform costume from a photo taken around 1886. 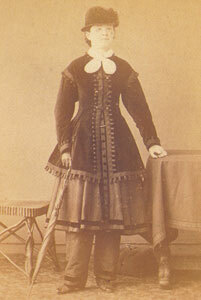 Often called “the forgotten women of the American Civil war,” female vivandière or cantineers dressed in similar uniforms as the regiments to which they were assigned. They supplied the “3 Ws” — whisky, wine, and water — to the fighting troops during battle. As volunteers, many fought alongside the men and were greatly admired for their bravery. 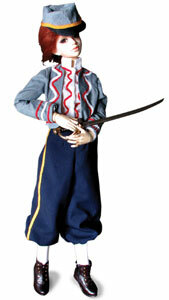 The preceding vintage photo and Joan Thilges’ doll costume shows a women in Zouave uniform, a style adopted by regiments on both sides of the war. The uniforms were based on those used by French soldiers during the Crimean War and earlier styles worn by North African recruits in the 1830s. 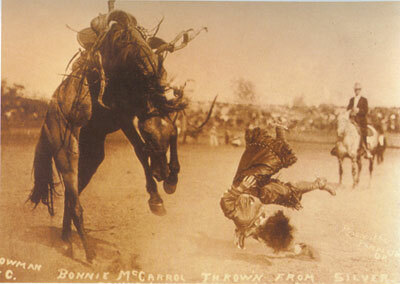 This photo postcard from 1915 shows rodeo perfomer Bonnie McCaroll. Whether performing as a bronco rider or taking on the role of a cowboy in the American West when men were not available or affordable, many women dressed in male attire out of necessity — skirts put them in danger of getting tangled in the stirrups or other gear. McCarroll died in 1929 after a bronco-riding exhibit in which her boot (not her pants) got caught in a stirrup. 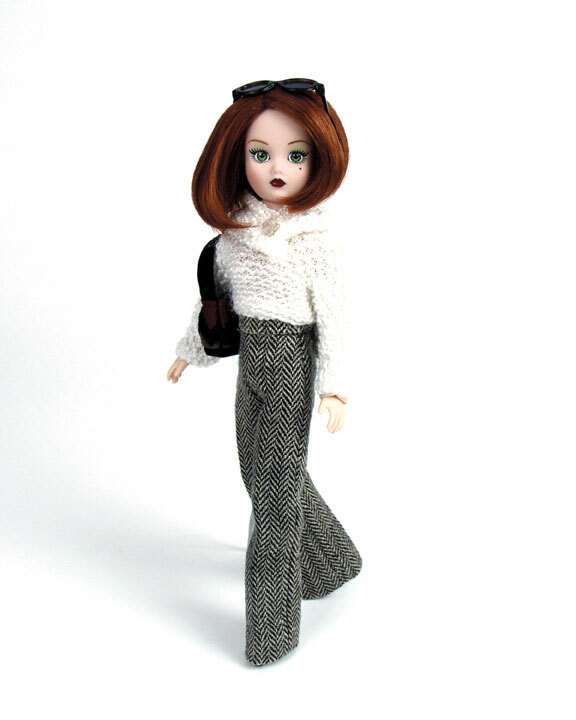 The seated doll wears Thilges’ re-creation of Bonnie McCarrol’s wide pants; the other doll reproduces a cowgirl’s wooly chaps shown elsewhere in the book. The hats were created by Cassandra Coleman. 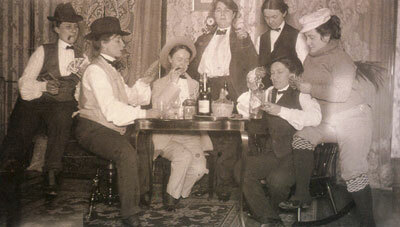 This photo, titled “A Group of Women Enjoying a Card Game,” is circa 1910. Women often enjoyed assuming male roles in which they were allowed freedoms of expression far beyond their normal social roles. 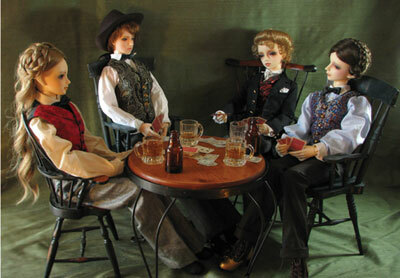 Julie Woodbury meticulously created the dolls’ attire for this reproduction of the original photograph. 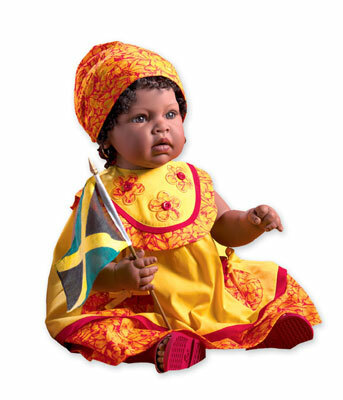 The garments are made of wool, silk, or brocade. Each one is fully lined, and vests and coats have functional buttonholes. Not all cultures frowned on women wearing pants. 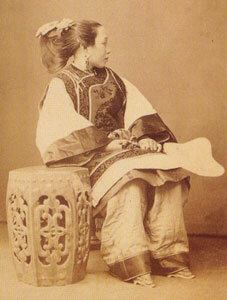 This photo, from the 1860s or 1870s, of a wealthy Chinese woman, was shown to compare the limitations and pain of her “golden feet” to the effects of the restrictive corsets forced upon European and American women. 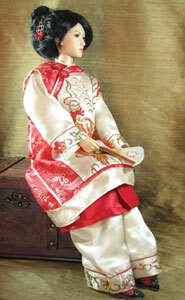 Thilges re-created the woman’s garment from a pair of 1920s Chinese-style pajamas. Wearing trousers is a fashion option taken for granted by most women in the 21st century, but it wasn’t so very long ago that females who wore bifurcated garments on their lower extremities in public were considered vulgar or indecent — and sometimes even unlawful! During Hollywood’s Golden Era, the l930s and ’40s, such movie stars as Kathryn Hepburn and Marlena Dietrich popularized the look of tailored slacks and sweaters, proving that pants could be not only practical but glamorous as well. “Downtown Abbey” fans may envision an even earlier time, when women donned “womanalls” to toil in factories as World War I created a shortage of male workers. Go further back, and you’ll see that women have been wearing pants for centuries, despite society’s efforts to dissuade them. 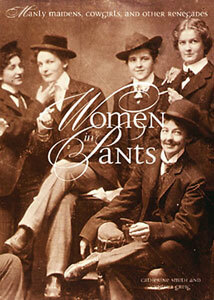 In the book “Women in Pants,” authors Catherine Smith and Cynthia Greig present a pictorial chronicle of women wearing trousers since at least the early 1800s. PreviousHeart, hearth, and home: A modern installation and a Jazz Age jewel have much in common.